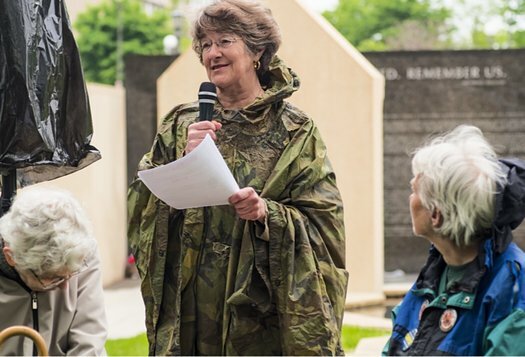 At the invitation of Minnesota Veterans for Peace, Becky Lourey delivered the 2013 Memorial Day keynote address at the Vietnam War Memorial on the Capitol Grounds in Saint Paul. Over the years, Becky has talked several times with many of the most-active members of the organization and this allowed her to speak directly and with some familiarity. "Many of you know," Becky noted, that Sunday (the day previous) was the eighth anniversary of the death of her son, Matt Lourey, in Iraq. She explained how Matt's widow, Lisa, could not unpack his items shipped back from Iraq - stored in her garage. Only recently, Becky helped Lisa with the unpacking and brought some belongings home - including Matt's poncho that had been soiled with vomit. Now washed out, she unfurled the poncho as she told the story, and donned it in the Memorial Day mist. ​"How fruitless it all is," Becky said, referring to the Iraq war. "What was solved?" Bombings continued, and sectarian conflict increased. For Lisa, the decision was made to shelve a promising military career after achieving the rank of Major. "Before the war, she was the Arabic translator for UNSCOM. So she knew. There were no weapons of mass destruction." Lisa is now studying Chinese Medicine. This year, Lisa again requested a copy of "Reflections on Matt's Death," written by Matthew's late father, Gene. "This was difficult for my husband. He was a Vietnam War protester." Becky quoted heavily from Gene's piece, including: "I would have chosen a far less physically dangerous and less militaristic path for Matt had it been my right to determine his duty. He knew it was not; he knew that each of us must determine for ourselves the purpose for which we were born." 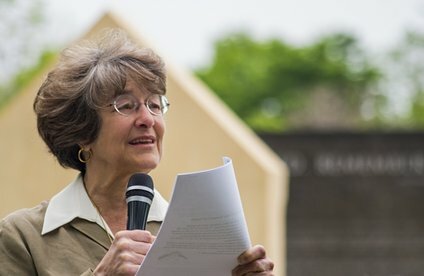 Although Becky remained at the Memorial Day event until everyone dispersed, she told the gathering of a young veteran she was eagerly hoping to see later in the day along the portion of the Munger Trail named in the memory of Matthew Lourey. Tony Zech would spend the entire 24 hours of Memorial Day bringing attention to a cause, and honoring the memory of Matthew. This wasn't exactly what Tony had originally intended, as Becky quoted from his original email contact with her, but it worked out to be a memorable experience in the end. Quoting Tony Zech's email, Becky stated, "My original goal was to raise money for Tragedy Assistance Program for Survivors by ruck marching (military version of backpacking) Grandma's Marathon held in Duluth. In light of the recent Boston Marathon bombing the race committee has created a policy that no bags are to be permitted along the course. I still plan on running the marathon but I have run them before and believe that the families of my fallen comrades deserve more." Making reference to Matthew, Tony Zech continued, "I decided there was no better way to honor fallen heroes than to maintain a 24-hour watch while walking a trail named after a hero." Becky concluded her remarks by making available information about Tony Zech, and referencing his Ruck and Remember blog. 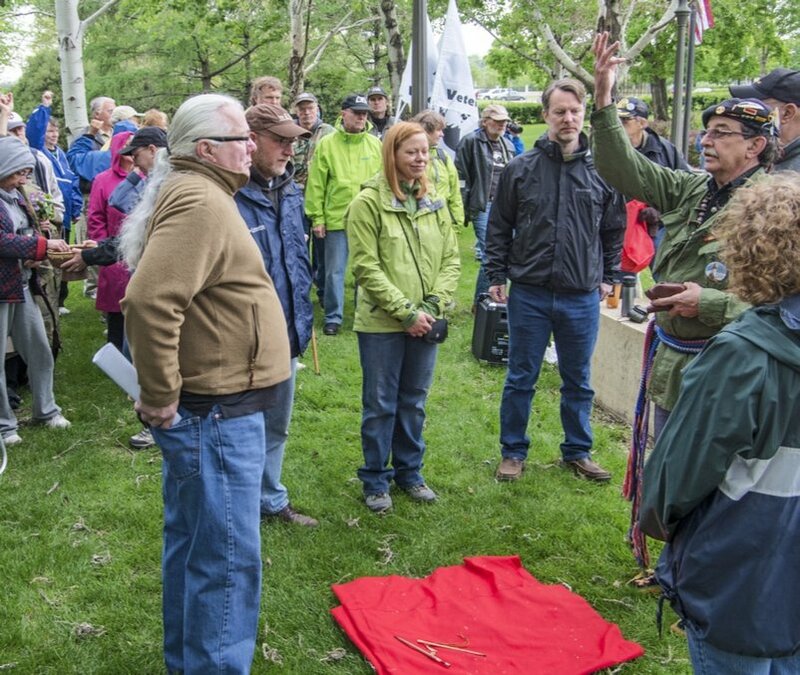 In the photo below nearing the end of the Memorial Day event, John Varone prepares to conduct a solemn peace pipe ceremony (see photo below).